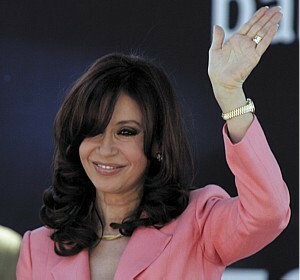 On Thursday, May 13, 2010, Argentinean presdient Cristina Fernandez opened the bicentennial festivities of Victoria, held at Plaza San Martin in the city of Victoria, Province of Entre Rios. Researcher Silvia Perez Simondini took advantage of this opportunity to present the first executive with an envelope containing CEFORA documentation regarding UFO declassification efforts in other countries, as well as the list of researchers that make up the organization that has been struggling for the declassification of the Argentinean Republic’s UFO archives. The president’s chief of safety and ceremonies accepted the documentation and provided the researcher with the phone number to the President’s documentation area to stay in conctact. Minutes later, the President approached Ms. Simondini, who asked her to please read the contents of the envelope, which she promised to do. Two days later, during communications with Casa Rosada, it was confirmed that thia documentation had been read. The promise of a reply via telephone and in writing was also confirmed. This is the first formal contact with Argentinean authorities regarding a request for declassification, in the hope that the desired goal can be achieved.